Balloonsguru is a balloon provider managed by eZvent Pte Ltd. We base in Singapore, and ship internationally. We are committed to be part of your significant events. Only available for orders without helium balloons. Your parcel will be delivered via doorstep standard courier service. You can expect to receive your parcel within the next 3-4 working days. All courier parcels come with a tracking number that will be sent to you once the parcel has been shipped out. Your parcel will be delivered via doorstep express courier service. You can expect to receive your parcel on the next 1-2 working days. Self-collection address: 61 Ubi Road 1 Oxley Bizhub, #04-10 Singapore 408727. Nearest MRT Station: Tai Seng. Please place your orders 2 working days in advance in order for us to have sufficient time to prepare your orders. Orders need to be made online prior to self-collection. You will be expected to receive a confirmation email from us. Select ‘Self Collection’ option during check out and fill in your preferred self-collection date and time in the comments box. Confirmation email should include an order number, which is necessary for self-collection. Self-collection hours: Monday to Friday, 10.30am to 6pm. Standard Door Step Delivery is at S$35. Please see below for the delivery rate chart. Free delivery for orders above $300 except for public holiday/PH eve, surcharge applicable. Please indicate your preferred delivery date, time and location during in the comments box before checkout. Delivery is from Monday to Friday from 10am to 7pm, subjected to availability. Orders must be placed (with payment completed) at least 1 day in advance. Otherwise, it will be considered as an urgent order. In case of urgent orders, please contact +65 6225 7335 to check availability for same day delivery. Please arrange for someone to receive the parcel at the indicated address as re-delivery will be charged at S$25 for each rearrangement of delivery. Please provide us with a mobile number to contact for delivery issues. Change of time/date/location is subjected to availability with a charge of S$5. Balloonsguru aims to provide efficient delivery but actual delivery time may vary by 30 minutes before or after your stated delivery time due to unforeseen weather conditions and traffic jams. However, rest assured that we are fully committed to fulfill get the orders to you punctually. No exchange or refund is allowed once items have been handed over in good condition. Delivery staff will arrive at the provided location and contact the recipient. If there is no one to receive the goods within 30 minutes, the delivery staff will leave a note and a re-delivery will have to be rescheduled. All overseas orders will be delivered by SingPost via registered airmail. Postage charges will be reflected accordingly during checkout process. Your parcel will be dispatched by SingPost registered mail, you may expect to receive your parcels within 7-14 working days at your doorstep. Your tracking number will be sent to you once your parcel has been shipped, please check the status of your parcel via SingPost website. Orders must be placed (with payment completed) at least 2 working days in advance. Otherwise, it will be considered as an urgent order. Please place your orders 2 working days in advance in order for us to have sufficient time to prepare your orders. Otherwise, it will be considered as an urgent order. Self-collection hours: Monday to Friday, 10am to 6pm. A confirmation email will be sent to you after payment has been made. Helium Balloon Weekday Delivery is at S$35. This mode of delivery is applicable for weekday, 10.30am to 6pm delivery. Please see below for the delivery rate chart and surcharge that may be applicable. Helium Balloon Weekday Off Work Hour Delivery is at S$55. This mode of delivery is applicable for weekday, 9am to 10.30am, 6pm to 8pm delivery. Please see below for the delivery rate chart and surcharge that may be applicable. Helium Balloon Weekend Delivery is at S$70. This mode of delivery is applicable for weekend, 10.30am to 6pm delivery. Please see below for the delivery rate chart and surcharge that may be applicable. Helium Balloon Public Holiday/Public Holiday Eve Delivery is at S$80. This mode of delivery is applicable for all Public Holiday and Public Holiday Eve, 10.30am to 6pm delivery. Please see below for the delivery rate chart and surcharge that may be applicable. 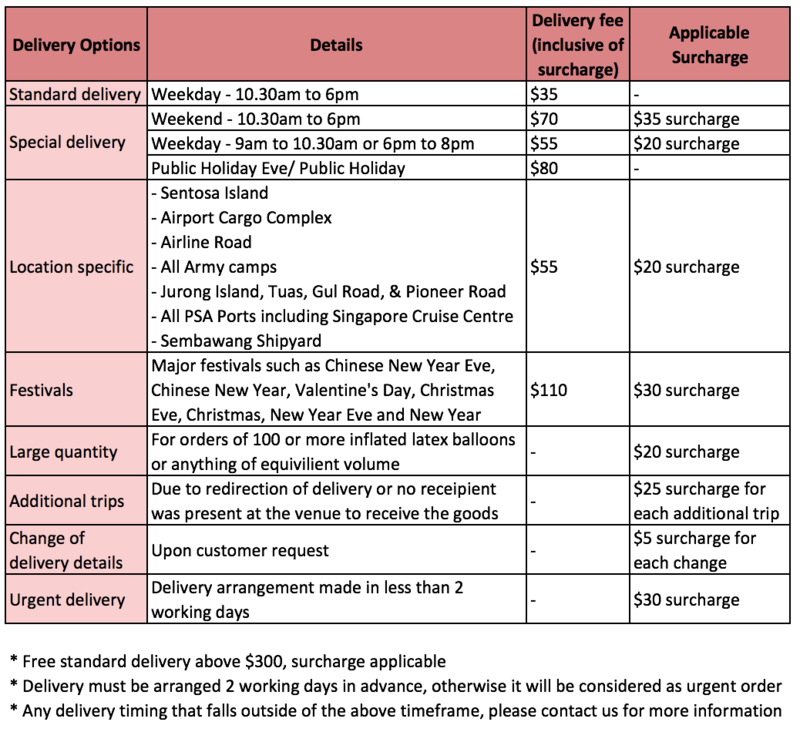 Helium Balloon Festival Delivery is at S$110. This mode of delivery is applicable for major festivals including but exhaustive to Chinese New Year Eve, Chinese New Year, Valentine's Day, Christmas Eve, Christmas, New Year Eve and New Year, 10.30am to 6pm delivery. Please see below for the delivery rate chart and surcharge that may be applicable. Helium Balloon Location Specific Delivery is at S$55. This mode of delivery is applicable to destinations including Sentosa Island, Airport Cargo Complex, Airline Road, All Army camps, Jurong Island, Tuas, Gul Road, Pioneer Road, All PSA Ports including Singapore Cruise Centre, Sembawang Shipyard, 10.30am to 6pm delivery. Please see below for the delivery rate chart and surcharge that may be applicable. We do not accept walk-ins without placing an order online. Cash on self-collection, PayPal through our website and bank transfers are accepted. A confirmation email from support@balloonsguru.com.sg will be sent to you after payment has been made. Confirmation email should include an order number, which is must be quoted for self-collection.